Over the course of 2 weekends the past year and a half, both Dani and I, and separately – his brother, spent time visiting the Philly area. We had done a lot of research and made sure to hit a bunch of the kosher restaurants during our visit. Being one of the oldest cities in America, there’s a lot of history here and is definitely worth visiting, especially during the warmer months. The following restaurants are located throughout the Philly region: downtown, Bala Cynwyd, Elkins Park, and Northeast Philadelphia. For exact locations, scroll down for a full map of all the restaurants. Holy Land Pizza – Good News – A pie here is $13. I was shocked. Bad News – You pay for what you get… we weren’t sure what that ‘interesting’ aftertaste was.. Not worth schlepping to Northeast Philly for..
Holy Land Grill – Our original plan was to check out Espresso Cafe and Sushi bar, as it came highly recommended, but they were having a sheva brachot and the restaurant was closed. So we headed over to Holy land. It was a simple Israeli grill, nothing fancy but the food was good and not particularly expensive. Shalom Pizza – We got to meet Shalom, the owner of Shalom Pizza, over shabbat as he was a guest by our host, and also the cook. We checked out his pizza one night for dinner, it was good – not NY pizza – but beggars can’t be choosers after all. Some other kosher locations we didn’t get to try: Palace Royal, Singapore Kosher Vegetarian, Hamifgash, and Espresso Cafe and Sushi Bar. Citron & Rose – this is the newest and fanciest of all of Philly’s kosher eateries. The restaurant had not yet opened when we were last there, but we will attempt to review it shortly. The reviews thus far have been extremely positive. UPENN Hillel – has a cafeteria that serves meals throughout the school year. The Franklin Institute – A large science museum enjoyed by kids and adults (if you are into the science thing). Exhibits include, electricity, the changing earth, and a giant heart.. theres an exhibit downstairs thats geared for the little kids, so we let our kids run around there for a while. Also included in regular admission is a planetarium. They have additional options such as an IMAX theatre, and a featured exhibit (changes per season – the mummy exhibit is running currently). Please Touch Museum – If you are coming with the little ones, this is somewhere the kids can have fun for hours! It’s basically large playrooms with different themes designed for kids to enjoy. My son loved pushing the wagon around at “Shop Rite” putting the different food items in, and then going to the “hospital” and pretending to be a doctor. The parents might be exhausted after this one though, but you’ll get plenty of “nachas” (english cant do that word justice) out of watching (running aruond after) your kids having fun. $$ Tip – If you come after 2pm theres buy two get one free which i didnt even know about beforehand. Also, there was plenty of parking on the street in front so no need to pay the $8 to park in the lot. Horse & Buggy Ride – For $30 you can get up to 6 people on a horse drawn carriage for a pleasant 20 minute ride around downtown Philly. (There are options for 30 min & 1 hour rides as well.) Independence Hall, Washington Square & Society Hill you’ll pass by, and you ahve a choice for the driver to give historcial tidbids or to just keep quiet and enjoy the ride. 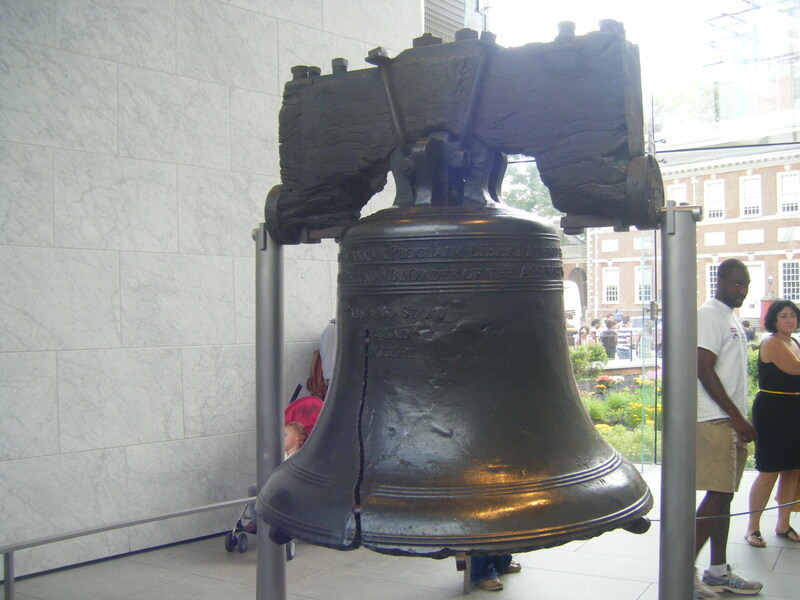 The Liberty Bell Center – Take yourself and your kids to see this amazing piece of American History. Great to see on a sunny summer day as it is situated in the middle of Constitutional Mall. Be prepared for long lines on Holiday weekends. Elfreth’s Alley – The oldest continuously inhabited Street In North America. Formerly home to artisans and merchants such as candlemakers, blacksmiths and bakers. A really quaint cobblestoned street with beautiful homes and adorable little shops. United States Mint – Dani was dying to go here. Unfortunately for us, being that it was a holiday weekend, the Mint was not up and running, although was still open for public viewing. We were able to go in and look around but they were not creating money. If you are fascinated by coins this is one place you’ll want to check out. Otherwise, it may be a snoozefest. 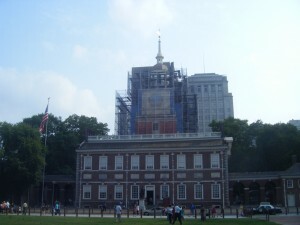 Being That Philadelphia is such an old city there’s a lot of great history there including Jewish History. Congregation Mikveh Israel – One of the oldest synagogues in North America. I fact it is the oldest continuous synagogue in North America. Started by Spanish and Portugese jews in 1740 the first synagogue building was built in1782. The current building is the fifth building and was built in1976. Famous members include Rebecca Gratz and Hayim Solomon. This is a great place to check out and explore for a wonderful primer on American Jewish History. Also make sure to check out the Mikveh Israel Cemetery the oldest evidence of Jewish life in Philadelphia. Rodeph Shalom – Started in 1795, this is the oldest Ashkenazic Reform minyan in the Western Hemisphere. It’s first sanctuary was built in 1873 and was rebuilt in the same spot 60 years later, Throughout the years the building has been refurbished and stands as a testament to Philadephia’s prolific rule in American Jewish History. National Museum of American Jewish Heritage – A fascinating Museum detailing Jewish life in America from 1654 to present day. Lots to learn and see with stuff for kids and adults of all ages.